When Chabal, who has played throughout the back five of the pack for France though his preference is No.8, arrived at English club Sale Sharks from Bourgoin in 2004 he was known as a hard-running but fringe member of Les Bleus' 2003 Rugby World Cup squad. During that competition in Australia he had a military-style haircuit - short back and sides. 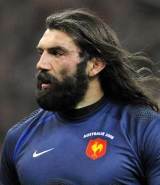 Not long after relocating to Manchester, the look changed to a bushy beard and, over time, the flowing long hair followed, and at the 2007 Rugby World Cup in his home country, Chabal was greeted as L'Homme des cavernes - the Caveman - everywhere he went. He was a rare example of a rugby icon, with crowds chanting a Neanderthal "ummm" whenever he had the ball. Chabal, from Valence, was by no means certain to make his second Rugby World Cup. The France coach Bernard Laporte indicated he did not rate Chabal highly enough as No.8, and selected him as a flanker in his early years. Eventually Laporte settled on Chabal as a mobile second row alternative to the first-choice Fabien Pelous and Jérôme Thion during the 2007 competition. In the quarter-final and semi-final Chabal was used as a replacement for Pelous. Having played more than half of the last-four defeat by England, Chabal was in tears at the end and his photo was splashed all over the French media. Before the midway point of the 2008-09 season, Chabal indicated he would leave Sale at the end of the campaign to return to France. The fans will miss him. When Chabal joined Sale he had 20 caps since first appearing against Scotland in 2000, and he was recalled by Laporte for the 2005 Six Nations Championship - partly but not wholly due to injuries to Serge Betsen and Olivier Magne. In that first season in England he collected a two-match ban for stamping against Bath, but the Sale supporters loved him and printed up t-shirts with his face on and took up the players' nickname for him which was "Seabass", from Sébastien. His debut in European club competition had been for Bourgoin against Spain in the Shield in September 1998 though he did not feature when his club won the final against Montferrand in Lyon the following February. Laporte's successor Marc Lièvremont rang the changes among France's forwards during the 2008 Six Nations Championship and Chabal missed out, but when a weakened France went on tour to Australia in June 2008 Chabal started both Tests. Approaching his 31st birthday in December 2008, he earned three more caps against Argentina, the Pacific Islanders and Australia in the November Tests, with a starting role at lock against the Wallabies. He remained a member of the France squad for the 2009 Six Nations and agreed a switch to Top 14 side Racing Metro at the end of that season before touring New Zealand and featuring in the historic victory in Dunedin. He lost is place in the starting line-up for the 2010 Six Nations but still played his part in France's Grand Slam campaign. A switch to No.8 at the end of the year brought more success but he lost his place in the wake of the mauling at the hands of the Wallabies - only to reclaim a starting berth against England in the 2011 Six Nations. But he lost his place once again in the wake of the shock loss to Italy and he later failed to earn a place in Lievremont's World Cup squad. And there was more bad news before the end of the season in the form of a 60-day ban for openly criticising Top 14 referees which ruled him out of the title play-offs. And going into the 2011-12 season, Chabal was looking to re-find his best form for Racing Metro in a bid to force his way back into the international reckoning under Philippe Saint-Andre. But he exited Racing Metro in January amid reports that he had fallen out with coach Pierre Berbizier. With rumours linking Chabal with a move to either Super Rugby or Stade Francais, the French behemoth lined up for Balmain in the curtain raiser to the Super Rugby game between the Waratahs and the Reds.